Free Google Analytics certification: how to get it. Tip 1- Get Search Keywords Ranking for Yoursite, and more! Google Search Console provides all the information about the keywords that lead people to your website. Link your AdWords account to track the efficiency of your paid advertising campaigns and to enable retargeting campaigns. Use custom dashboards template to visualize data in the most appropriate visualization format. 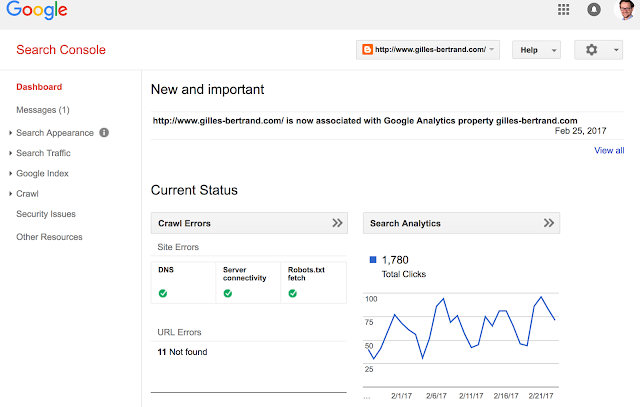 Link your Google webmaster tools (now called Google Search Console) account to the Google Analytics accounts for greater insights into the search keywords that link to your website. Follow the instructions here. Define filters to curate the analytics data. A classical example is to filter out all the IP addresses that start with the prefix of your company. You should also set advanced filters to remove the lines that refer to a low number of clicks to avoid irrelevant noise in your data reports. Define campaign tags to track the results of campaigns and cross-channel initiatives on your measured properties. For instance, if you have launched an emailing campaign, you will want to track the number of people who have clicked on a link. To do this, you will create and use campaign tags. These tags enable Google Analytics to display more relevant information about the cross-channel actions. Tags are super powerful: you can also use them to pass the answers from a form on your website to Google analytics and add specific dimensions to your google analytics views, but this goes beyond the requirements of the Google Analytics certification. Direct vs organic search channels: most people find my blog through Google! First, use the default audience view to analyze which channels bring significant traffic to your website. It may sound obvious, but you should focus your efforts first on these channels. Review the flow of visitors in your website. Typically, you will notice that some of your most popular pages have a high bounce rate. You should solve these issues with the appropriate calls to action. Look at the bounce rate depending on the browser type to check if your website offers a good experience on various devices. If the bounce rate is higher with mobile browsers, you should review the website design. Review the acquisition reports to see how your various marketing channels perform and especially organic vs paid, and the contribution of social, emails, etc. AdWords reports show what happens after people click on your ads: how they navigate your website. They can show fewer visits than clicks, for instance, if some users use Ghostery and other privacy protections to block Google Analytics scripts. The keyword reports permit you to see which ones lead to conversions or engagement. The ROI metric enables you to shine in front of your bosses or to identify issues with your paid campaigns and request adjustments to the keywords and banners to your agency. The destination URL dimension is particularly interesting to see which landing pages are worth investing in because they drive high conversions. Inboung marketing: this is how you get certified. For free!